Oh, Nails, how underrated you are! If yours look anything like mine you have been wearing mittens way longer than necessary. As I am typing this I am gnawing on my cuticles like it is my last meal. (I know! Terrible habit) Unfortunately, I still haven’t hit the lotto, so the bi-weekly manicures haven’t quite inched their way into my budget. But luckily for us, there are great shades available this spring. Feel free to skip around Target like it was a field of flowers. Go ahead! I won’t judge. Don’t want to commit to a whole bottle? No worries!! 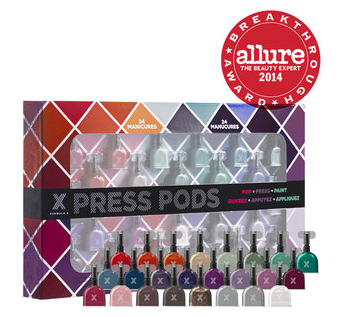 Try out these Formula X Press Pods. They are little samplers that allow you give each of your nails 2 coats. Just pop the top, press the X on the label, and paint away. Plus they are on sale!! QUESTION: Do you ever bring your own nail polish to the nail salon? Oh what cute nailpolish shades! I really need to get my nails done! I like to bring my own nail polish to salons. You don’t necessarily know if the person before you has any sort of sickness or whatever. Especially since the manicurist cuts the cuticles. I usually only get pedicures (about once every three to four months). I like the color choices you’ve displayed! I did not know there’s already something like this in the market. I will definitely check this out! My favorite is shade #8. It matches with any outfit. Amazing! Now I don’t have to be stuck with a lot of unused and old bottles of nail polish in my closet.